The transcription factor NF-kB regulates immune and inflammatory responses and is implicated in the pathogenesis of inflammatory diseases and cancer. Our studies helped elucidate the role of the NF-kB pathway in health and disease. Consistent with its proposed tumour promoting function, we found that constitutive activation of NF-kB drives intestinal tumorigenesis (Vlantis et al, JCI, 2011) while NF-kB inhibition prevents skin cancer (Kim & Pasparakis, EMBO Mol Med, 2014). However, our experiments revealed a paradoxical side of NF-kB signalling that was not compatible with its key pro-inflammatory and pro-tumorigenic functions. We could show that mice with liver specific knockout of NEMO, the regulatory subunit of the IKK complex that activates NF-kB, developed spontaneously chronic liver disease and hepatocellular carcinoma (Luedde et al, Cancer Cell 2007), while inhibition of IKK signalling in intestinal and skin epithelia caused spontaneous inflammation in these tissues (Pasparakis et al, Nature, 2002; Nenci et al, Nature 2007). These studies showed that NF-kB is critical for the maintenance of tissue homeostasis and the prevention of inflammation, revealing a previously unappreciated complexity of NF-kB signalling. Our current research aims to dissect the mechanisms and pathways determining the pathogenic and beneficial outcomes of NF-kB signalling, ultimately aspiring to use this knowledge for the development of therapeutic approaches that inhibit the detrimental consequences of NF-kB activation without affecting its beneficial functions. 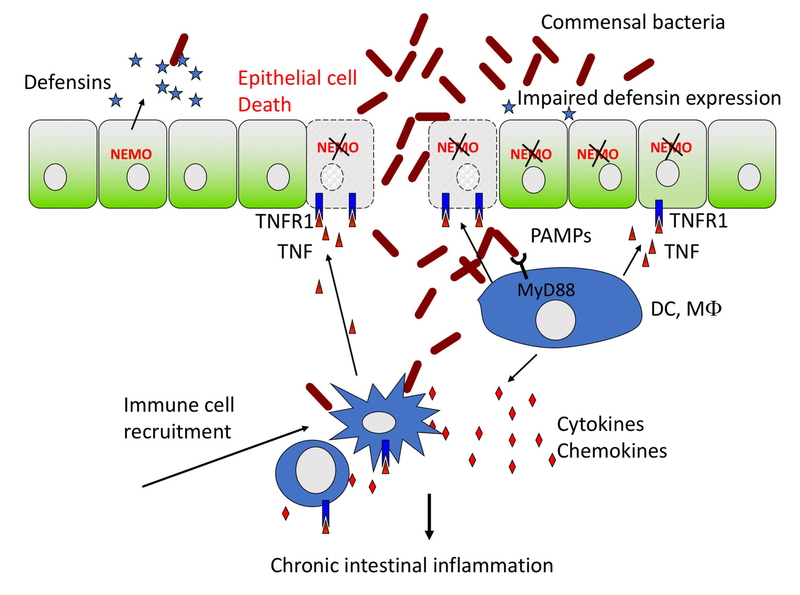 NEMO deficiency causes TNF-mediated death of intestinal epithelial cells, which compromises the intestinal barrier and allows the translocation of commensal bacteria from the intestinal lumen into the mucosa. The recognition of bacteria by mucosal immune cells triggers the production of inflammatory cytokines and chemokines including TNF, which causes further increased death of intestinal epithelial cells fuelling a feed-forward loop resulting in chronic unresolved inflammation.